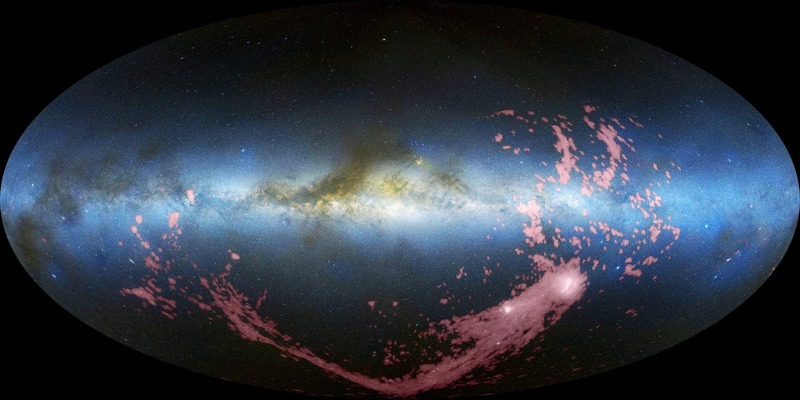 The Milky Way and Magellanic Clouds are blue and white, and hydrogen gas in the Magellanic Stream, in the disks of the Magellanic Clouds, and in the stream's Leading Arm is red. The Milky Way is horizontal in the middle of the image, and the Magellanic Clouds are the light spots at the center-right portion of the image, from which the gas stream originates. Dust clouds in the Milky Way are brown. David Nidever of the University of Virginia and colleagues used the National Science Foundation's Robert C. Byrd Green Bank Telescope (GBT) to fill important gaps in this picture of gas streaming outward from the Magellanic Clouds. The Magellanic Clouds are the Milky Way's two nearest neighbor galaxies, about 150,000 to 200,000 light-years distant from the Milky Way. Visible in the Southern Hemisphere, they are much smaller than our galaxy and may have been distorted by its gravity. After observing the Magellanic Stream for more than 100 hours with the GBT, the astronomers combined the GBT data with data from earlier studies with other radio telescopes and found that the stream is more than 40 percent longer than previously known. Astronomers say the longer length means the gas stream is older than previously thought, probably around 2.5 billion years.